Eating alone in restaurants is awkward. Sure, you can take a book and pretend like the solitude is emboldening. But be honest with yourself—sitting across from an empty chair is sometimes sad and lonely. This whimsical restaurant in Japan has a solution: stuffed animals. The Moomin Cafe in Tokyo is themed around the eponymous series of Finnish picture books, and it's just adorable. According to the countless visitors who have posted photos and written about their experiences there, the restaurant's waiters provide solo diners with a giant stuffed animal to keep them company while they eat. It's unclear if it's acceptable to talk to the stuffed animal during dinner. It's hard to tell how much this is just a cute gimmick for fans of the Moomin series or if it's a total rethinking of the dining experience. The extent to which the rest of the cafe is totally dominated by images from the books can't be missed. 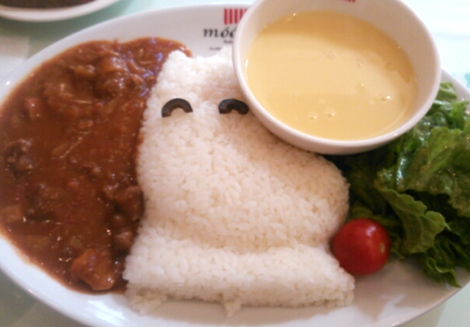 After all, even the food looks like the characters. However, this idea of filling empty seats with fun is terrific. Eating alone is usually frowned upon, but when it comes as part of a larger experience, it seems kind of cool. You can still read your book, too!